When the communists took over Bulgaria in 1944, some 600 Orthodox priests were killed, the then patriarch was sent into internal exile, and the Church fell under the control of the state. For the next 45 years religious observance was strictly controlled: as in Russia, old women were allowed to attend church, but anyone else risked harassment, loss of employment, arrest, even jail. Most Orthodox priests had little choice but to go along with the new order, but many also became actively involved in the structures of communism, as informers for Bulgaria’s hated secret police, the Darzhavna Sigurnost. Maxim was named Patriarch of the Bulgarian Orthodox Church in 1971 at a convention that appeared to conform to church rules that the patriarch be chosen by clergy and laity. But after the fall of communism in 1990, critics within the church cried foul, alleging that the election had been a fraud, with two thirds of the ballots written in the same hand. Maxim, they said, was nothing more than a communist stooge. In 1991 the rebels formed a “renewed synod” consisting of 12 bishops who rejected Maxim’s authority. Five years later they enthroned an alternative patriarch, Metropolitan Pimen, a 90-year old bishop who, somewhat ironically, had himself worked closely with the communist regime. Maxim immediately responded by declaring his rival “anathema”. The schism had political overtones: Maxim and his supporters had the backing of the Socialists (the former Communists), while Pimen and his supporters received the backing of the Union of Democratic Forces (UDF). Ivan Kostov, who served as UDF prime minister from 1997 to 2001, refused to register the Bulgarian Orthodox Church under a law that required all religious groups to renew their registration with a government agency, and he and his party colleagues refused to attend masses celebrated by Maxim or his prelates, instead attending dissenters’ services. At one point the dissidents claimed to have rallied 30 per cent of the country’s 1,000 priests to their cause. For more than a decade the two churches existed side by side as Orthodox Bulgarians (officially 80 per cent of the country’s 7.4 million people) were treated to the unedifying spectacle of rival groups of long-bearded clerics coming to blows in a turf war which saw church buildings occupied and reoccupied, and police intervening to break up fist fights. In 1992 fully-robed priests, armed with bottles, iron bars and a battering ram, attacked the church’s headquarters in Sofia in an attempt to dislodge rebel clergymen who had seized control of the building. On another occasion water cannon and tear gas were turned on rebel bishops to clear Sofia’s Alexander Nevsky Cathedral. In 1996 the dispute switched to a factory in the Sofia suburbs which makes the candles traditionally lit by visitors to Orthodox churches, and which had been seized by the rebel faction. Maxim’s supporters succeeded in ousting the dissidents, depriving Pimen of valuable income. Hope of resolving the schism rose in 1998, when a pan-Orthodox synod was held in Sofia. A formula was worked out whereby Pimen and his supporters formally repented their rebellion, the anathema was lifted and the rebels were restored to full communion. Maxim, for his part, appeared to indicate that he would resign and retire to a monastery. The deal soon unravelled, however, when he announced that he had no intention of going. But the rebels were never recognised under Bulgarian law or by Orthodox Churches elsewhere, and their cause received a further blow when Pimen died in 1999. Maxim’s position was strengthened when Bulgaria’s former king, Simeon Saxe Coburg, was elected prime minister in 2001 and insisted on taking the oath of office on the Bible in his presence. However Bulgaria’s theological battles continued to rage until 2004 when a court ruled decisively in Maxim’s favour, ordering the eviction of the rebels from their own churches. Images of priests and old women being dragged from their worship by burly, armed policemen flashed round Bulgaria, sparking outrage. The schism only finally ended in 2010, when the head of the alternative church dissolved the rebel synod. The dispute did nothing to raise the prestige of the church among Bulgaria’s Orthodox community. In one recent poll, 70 per cent of all Bulgarians declared themselves to be religious, but only 10 per cent saw churchgoing as an important part of their religious observance. The percentage who attend church regularly is smaller still. Many Bulgarians remained suspicious of Maxim. When a parliamentary committee revealed earlier this year that 11 of the church’s 15 most senior bishops had been secret police informers under communism, there was surprise that Maxim’s name was not on the list. Marin Naidenov Minkov was born on October 29 1914 in the mountain village of Oreshak, in the northern part of central Bulgaria. He became a novice monk in late childhood and studied Theology at the Sofia Seminary. In 1938 he entered Sofia University’s theology department and was ordained a priest in 1941, subsequently adopting the religious name Maxim. After the establishment of communist rule, in 1950 Maxim was sent to represent the Bulgarian Church in Russia. Returning home in 1955, he became secretary-general of the Bulgarian Orthodox Synod. He rose through the Church hierarchy and was elected patriarch on July 4 1971. The main highlight of Maxim’s patriarchate was the visit by Pope John Paul II to Bulgaria in 2002. Though Maxim had been lukewarm about the visit, his meeting with the Pontiff was seen as helping to improve relations between Catholics and Orthodox believers following a millennium of distrust. The Pope also used the opportunity provided by the visit to declare that he had never believed allegations that the Bulgarians had been behind the attempt to assassinate him in 1981. A church council now has four months to choose a successor. 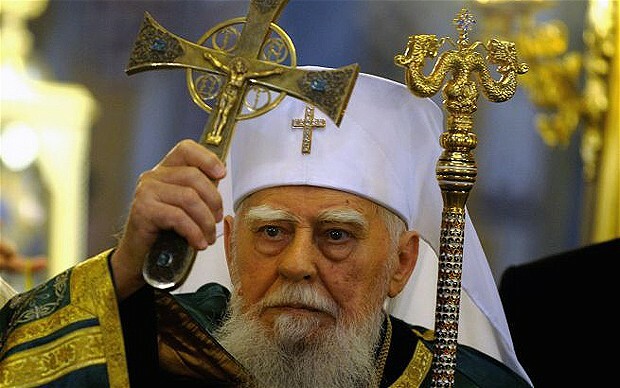 Patriarch Maxim of Bulgaria, born October 29 1914, died November 6 2012.